“All Animation channels are blocked as per order of DC”. Doraemon, Chota Bheem are no more seen in most houses of Belgaum who have subscribed to the local cable operators, as Ridhi vsion and Vardaraj the two major cable operators have blocked the transmission of Cartoon channels. 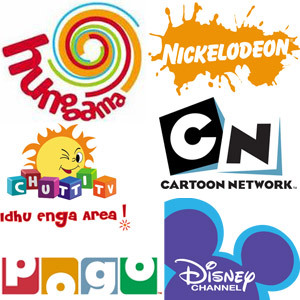 How ever one Kannada Cartoon channel Chintu TV is still being shown. Parents associations and some other groups had given a memorandum to the DC and the cable operators some time back that transmission of cartoon channels be blocked during the exams season as the kids normally will watch only TV and will not study. For the past 2 weeks transmission of cartoon channels has been blocked but this is not the case with the users who have DTH connections. I Think This Is A Debatable Decision Given By DC Of Belgaum. The Parents Need To Control Their Kids. Instead Of Stopping The Broadcasting Of Cartoon Channels, Parents Should Disconnect Their Cable Connection. If The Cable Connection Is Active, Mothers Watch Daily Soaps And Dads Watch Sports Channels. If Cable Is Disconnected Dads And Moms Can Utilise That Time What They Spend In Daily Soaps/Sports Channels In Kid’s Studies. Regarding Cable Operators, I Am Pretty Sure They Are Happy With This Decision, They Are Not Loosing Anything But Making Money Out Of This Decision. want their child to study i ll nt be done just switching off t.v. Summer is approaching. Kids like to play with water too. Now what, block water supply to everyone!!! Stop acting like foster parents to kids of others. I have a diffrent take on these cartoon channels. If you look at the cartoons like chota Bheem, doraeman etc, all are full of violence scenes. Todays cartoon shows have no moral stories they are all commerical in nature and giving scope to violence and unhealthy competition among the children. In stead of giving memorandum to DC it is better to write broadcasters to stop such shows. why u want to take off Animation ppls Jobs ..??? I don’t think blocking Cartoon channels is right. That clearly shows that parents do not have control on their child. The child has to learn it the hard way if it does listen to parents. Wake-up parents its time you make them listen to you, else you will have a tough time later. Today they are not listening to you from not watching cartoon channels during exam time tommorrow they will not listen to you for something else. What will you do then ? And coming to the DC order to stop cartoon channels is he or can he stop DTH Cartoon channels. No way is it ! Very simple the DC should have told the parents to control their child and make them listen. Simple isn’t it. I pity the Cable operators in this matter. This is disgusting n insane… partents who cannot control their children want such things.. I suggest you “partents supporting this” better remove Cable from your house rather than blocking cartoon channels and troubling the entire belgaumites. Stop being a comedy piece to the world 🙂 and Please unblock the cartoon channels at the earliest.